Jim Hicks is a veteran lawyer whose practice is focused on the litigation and transactional needs of individuals and businesses. His broad career experience and knowledge base allows him to advise clients on day-to-day legal and operational matters, resolve workplace and business-related disputes, and assist clients in achieving their business objectives. Jim’s counseling and transactional practice encompasses every phase of a business’s life and includes entity formation and organization, corporate governance, contract drafting and negotiations, mergers and acquisitions, divestitures, financing, construction and development and real estate. 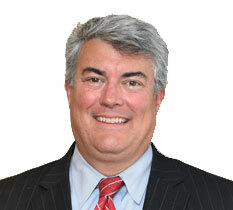 His litigation practice experience is equally diverse and includes commercial disputes, construction, directors’ and officers’ liability, dental malpractice and real estate. He also counsels clients on workplace matters arising from the employer-employee relationship. In addition to having extensive experience as a commercial litigator in state, federal and appellate courts, Jim’s practice is also devoted to representing clients in probate, estate planning and family law matters. Jim is currently serving as a member of the Board of Governors of the Oklahoma Bar Association for 2015-2016. He most recently served as President of the Tulsa County Bar Association in 2013-14 and is currently Vice President of the Tulsa County Bar Foundation. Jim also serves as the Senior Warden of St. John’s Episcopal Church in Tulsa, Oklahoma. He was named Oklahoma Bar Association’s Outstanding Young Lawyer, 1995; Tulsa County Bar Association’s Outstanding Young Lawyer, 1993, and recipient of the TCBA President’s Award, 1992. Recognitions: selected to the Oklahoma Super Lawyers® list in 2009, 2010, 2011, 2012, 2013 2014 and 2015; AV® Preeminent™ Rated Lawyer for the last seventeen (17) years. Voted by the readers of Oklahoma Magazine as Best Attorney in the 2011 “Best of the Best” and again in 2012. Counsel in Reported Cases: In re Texas International Securities Litigation, 114 F.R.D. 33 (W.D. Okl. 1987); Moon v. Guarantee Insurance Co., 1988 OK 85, 764 P.2d 1331 (Okl. 1988); Vanguard Production, Inc., v. Martin, et al., 894 F.2d 375 (10th Cir. 1990); In re Roberts, 117 B.R. 677 (N.D. Okl. 1990); In re Will Rogers Jockey & Polo Club, Inc., v. Oklahoma Horse Racing Commission, 111 B.R. 948 (N.D. Okl. 1990); National Football Scouting, Inc., et al., v. Continental Assurance Co., 931 F.2d 646 (10th Cir. 1991); Marx v. Reeds, 145 B.R. 703 (N.D. Okl. 1992); In re Osborn, 176 B.R. 941 (E.D. Okl. 1994); Howell v. USA, ex rel IRS, 1995 WL 324659 (N.D. Okl. 1995); Wells v. Boston Avenue Realty, 125 F.3d 1335 (10th Cir. 1997); Bank IV Oklahoma, N.A. v. Phillips, 1997 OK CIV APP 49; Smolen v. Hartley, 227 B.R. 757 (10th Cir. BAP, 1998), affirmed 194 F3d 1320 (10th Cir. 1999); Cranford v. Bartlett, 2001 OK 47; Sagona v. Sun Company, Inc., 2002 OK CIV APP 93; Sheehan Pipe Line Const. Co. v. Laney Directional Drilling Co., 228 F.Supp.2d 1271, (N.D.Okla., 2002); In The Matter Of the Gross Production and Petroleum Excise Tax Protest of Bruner, 2006 OK CIV APP 21; Pope v. Fulton, 2013 OK CIV APP 84; R&R Engineering Co., Inc. v. Board of Review OESC, 2014 OK CIV APP 26. © copyright Forge Multimedia llc. All Rights Reserved. Attorney Advertising. The hiring of a lawyer is an important decision that should not be based solely upon advertisements. This web site is designed for general information only. The information presented at this site should not be construed to be formal legal advice nor the formation of a lawyer/client relationship.